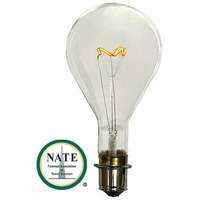 H&H Industries is a proud member of NATE. Quality-made in North America, H&H Task-Master™ Code Beacon lamps provide an extra measure of protection wherever tall air traffic hazards exist. They're bright, dependable, and long lasting—exactly what you need when lives depend on light. Life-rated up to 8,000 hours, they save on maintenance and replacement costs, as well as the number of bulb-changing operations at hazardous heights. Made of weatherproof "hard glass," they easily stand up to rain, sleet and snow. The rugged tungsten filament shrugs off wind vibration and shock that would destroy ordinary filaments. The mogul prefocus nickel-plated brass base assures positive contact and automatically positions the filament for maximum visibility. And it won't corrode in the socket, even after thousands of hours of use. Choose H&H Task-Master™ Code Beacon lamps for all types of air traffic hazards: cell towers, radio and TV towers, microwave towers, building towers, hospitals, bridges, and power lines.